Scalable separation, also called preparative chromatography, is the production of any amount of compound, from 1 mg to 1 kg, using the same method. 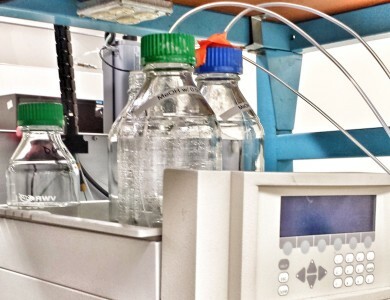 Supercritical Fluid Chromatography (SFC) is one system that enables easy scale up. Both HPLC and SFC are scalable. However, it’s easier to run scalable purification with SFC. SFC replaces the use of more toxic chemicals with CO2. This limits the use of hazardous solvents consumed during chromatography and takes advantage of the fact that at certain pressures, CO2 will behave like a fluid solvent, serving as both carrier (by dissolving and moving a substance) and eluant (a solvent used to remove something from a substance). The result is a process that is 10-20 times faster and more efficient that can be used for analysis and production of pure samples. In medicinal chemistry, a scientist typically has a growing program that needs more and more source material. SFC technology makes it easier to keep up with this type of growth. By running overnight…we can do 1 injection or 1000. What matters to the client is that they have the material they need. The fact that we can grow as the client grows is important. The cost of an individual sample goes up as you eliminate drug candidates. A pharma company might start with 10,000 candidates that cost $0.50 each to process. Then maybe they get down to 1,000 candidates that cost $10 each to process. When you get down to only a few samples, it can be very expensive to generate more of that compound. Chiral separation is a great option for chemistry teams winnowing down candidates. The upfront cost to produce material is less expensive than synthesis, and it delivers the exact quantity needed – no more, no less – furthering its economic value. As the top candidate is chosen teams look at other of producing the greater amounts of material. Averica Answers Video: What is Scalable Separation? Want to better understand scale up choices and the economics of your choice?